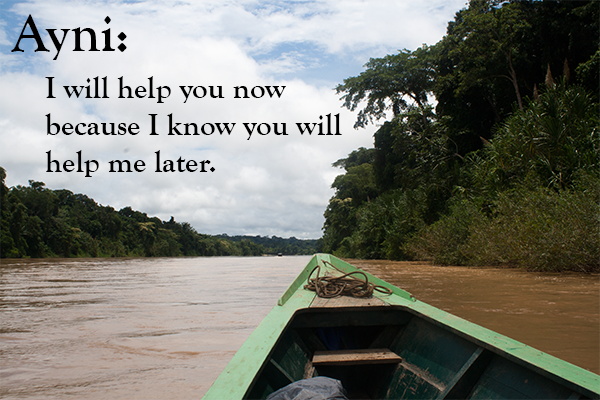 A collaborative story written during a creative writing workshop between the Forest Online and Wild Forest and Fauna’s Future Leaders program. Written by Dani, Luke, Ana, and Katerin. En algún lugar del bosque tropical amazónico de Perú, Kadal caminaba por la trocha contemplando los árboles. Ella estaba perdida sin salida. Kadal construye en refugio al pie de un árbol de ceiba para protegerse de los rayos, truenos en lo pro fundo del bosque; finalmente logro construir su refugio cortando bambú descubrió que dentro de él había agua limpio y claro. Entonces calmo su sed, pero moria de hambre vio a su almededr Frutos coudos y maduras, algunos ro edores como el sajino y picero comían agua je y chapaja. Entonces se siento segura y los probo gustándole el sabor, ají mismo vio hongos comestibles llamados cayampa, cambiándolo em Monmigas y Termitas que encontró al pie de un árbol sedo. 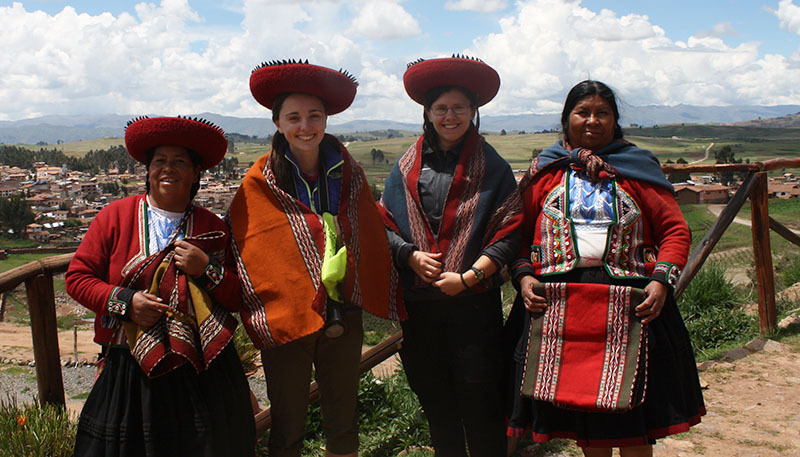 Lucy Benson (second from the left) and Danielle Fatzinger (second from the right) with two women from Balcon del Inka. Photo by Jason Scullion. 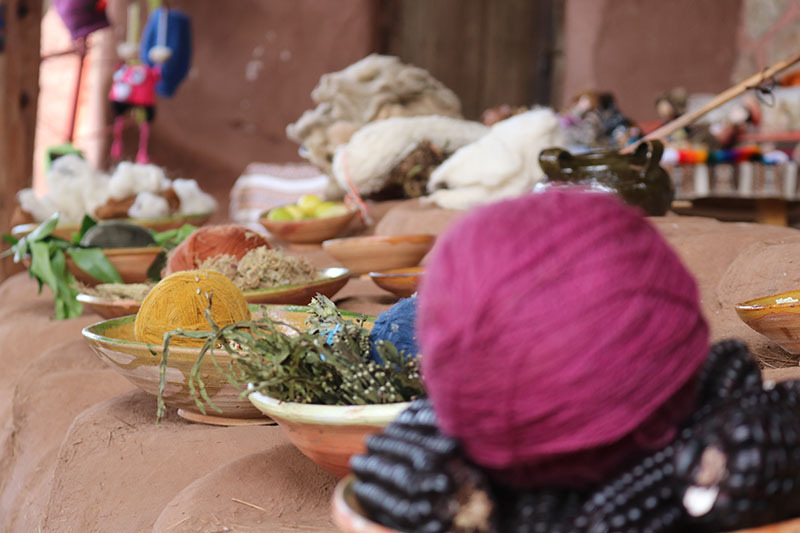 In the Sacred Valley outside Cusco, 14 Quechuan women of the town of Chinchero run El Balcón del Inka, an association of textile artisans that have formed a partnership with local tour guides. They demonstrate traditional processes of creating woven textiles, including spinning and naturally dying both alpaca and sheep yarn. 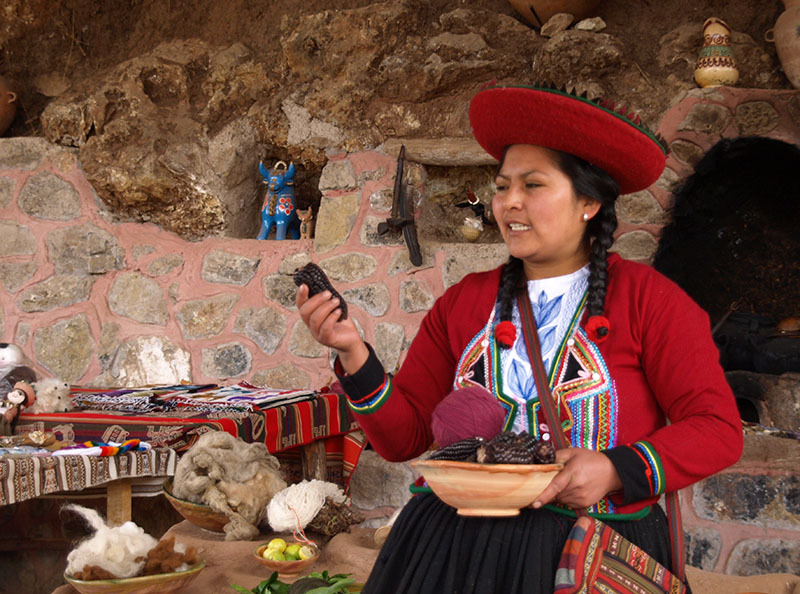 The women of Balcón del Inka come from 13 different families within the community. They formed the association seven years ago when they recognized the increased tourism to Cusco and the Sacred Valley as a business opportunity. Each of the women sells their products individually within the on-site group market. Upon arriving on site, the class took some time to admire the Inca ruins of the palace of Tupac Yupanqui, Inca ruler and son of the famed Pachacuteq. From there, we went up a slope to the welcoming sound of the women singing a traditional Quechuan song. The demonstration of the process of weaving was detailed, educational, and funny. The class sat in amazement as white, handspun thread was dyed using plants and bugs from the surrounding area. Cochinilla, a small bug found on prickly pear leaves, can be used to make 24 different colors, including red, pink, orange, and purple. The patterns used on their products include universal weaving patterns as well as patterns from their community. They also add woven borders to many products, which is a technique not found in other communities. The women started learning to weave around the age of 7 by making belts and bracelets. By the age of 15 or 16, they can make table runners and other more advanced products. In their community, women are the ones that weave, but in other communities, both men and women participate in the weaving. The same system of teaching is used today with children that wish to learn, but as a result of increase global influences and the resulting rapid modernization, many children do not wish to learn. Unfortunately, disinterest amongst the younger generation is not the only threat to the cultural traditions of the women of Chinchero. Over the next seven years, an international airport will be constructed in the town that will likely lead to further industrial development, disruptive air traffic, and sound pollution. We asked the women about their feelings surrounding the construction of the airport. 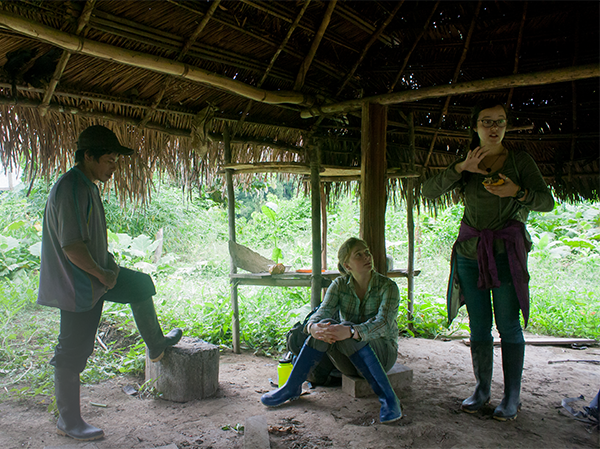 The women’s responses expressed concern about negative environmental impacts that could affect their connection to the land, their families’ farms, and their sources of material for dying. The threats facing El Balcón del Inka mirror those facing native communities throughout Peru and the larger Andean region. Pressures of a globalizing economy often demand a lifestyle incompatible with traditional cultures and livelihoods, which forces many people to adapt in order to survive. Seeing the traditional weaving techniques showed us how strong, creative, and resilient the people are in native communities. 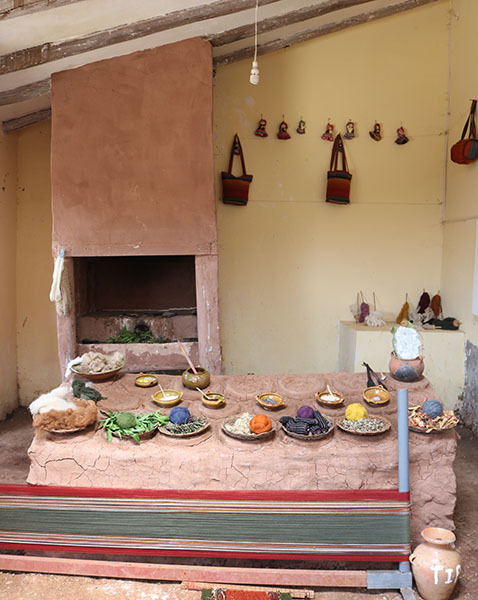 Given the current and coming threats to their lifestyle, we find ourselves concerned about their fate and agitated at the way Western ideas of modernization and development are often imposed on communities like Chinchero.